Saturday is for... total admiration and envy. This Frank Lloyd Wright home in Millstone, New Jersey has been rebuilt by architects Lawrence and Sharon Tarantino, who also own the house. The restoration has been so sympathetic and striking that they won a Wright Spirit Award in the private category from The Frank Lloyd Wright Building Conservancy, which “honors original or subsequent Wright homeowners who have rescued a building or have demonstrated outstanding stewardship in its conservation”. Read the story of the 20 year process that included being flooded twice, and their unique solutions addressing the problem, here. 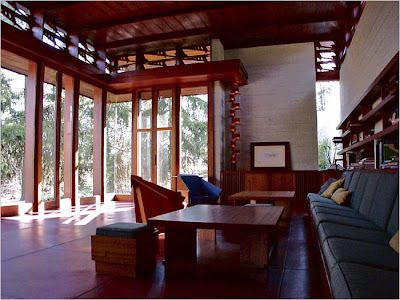 What a wonderful life endeavor to restore, maintain and live in a house designed by Frank Lloyd Wright. Your efforts will be very much appreciated by current & future architectural enthusiasts. AHHHH!! Gorgeous! What a dream!